Lemon Basil Zoodles is a healthy meatless meal that is so delicious and you can whip it together in under 30 minutes! You don’t have to be a vegetarian to love this dish! Zoodles are a great alternative to pasta when your trying to cut carbs and calories. One of my children loves zoodles and the other will eat them if I mix in a small portion of pasta. I used to pan fry mine, but I found that they got too soggy. When you cook zucchini, it can get very watery. I’ve heard that you can salt vegetables like this prior to cooking, but I try to avoid adding any unnecessary salt in my cooking. One method that seems to work better is to spread the zoodles out in a pan and place them in a hot oven for a few minutes until heated. Sometimes I do this, but more often, I heat them in a skillet for a minute or I just eat it raw and top it with a hot spaghetti sauce. If you are adding pasta to this dish, then the heat from the cooked pasta is more than enough to heat the zoodles. Begin by cleaning your zucchini and trimming the ends, then slice them into zoodles, whether by using a *spiral slicer or julienne slicer (example shown here), and set aside. *If you will be adding pasta to this dish, then prepare 6oz, according to the directions on the package. While the pasta is cooking, clean and dry your spinach and basil. Set a few basil leaves aside for garnish, then slice the remaining basil and spinach into ribbons. After the pasta is cooked and drained, add the olive oil, lemon juice to a large skillet over low-medium heat. Once the oil begins to heat, add the sun dried tomatoes, garlic and give a good stir, then mix in the spinach and basil. As soon as they begin to wilt, add the zoodles and pasta to the skillet and completely coat them. Serve into bowls and top with shaved parmesan, crushed red pepper, salt & pepper. Serve immediately. 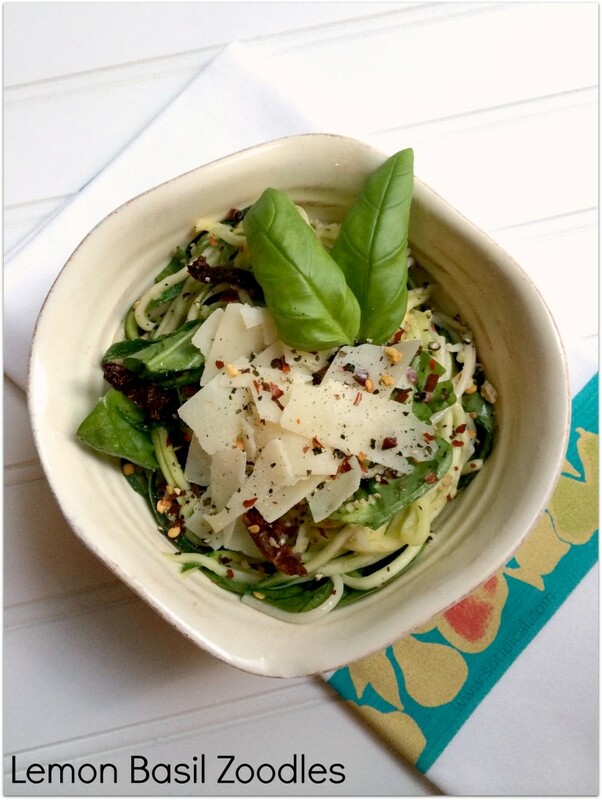 Enjoy your Lemon Basil Zoodles! * Affiliate Link is posted for the spiral slicer. I tried zoodles before and they can be somewhat bland. Your recipe makes great use of spices and cheese to spice it up. Great job Christine! Thanks Mike. I just made a zoodle salad too. Keep an eye out for that soon. It has plenty of flavor! Your recipe looks very refreshing and delicious. I would love to try! There are so many spiral slicers out there. I have a Veggetti which works well, but I have a hard time using it for carrots. They break or get stuck. For now, the Veggetti is good for my zucchini, but I’ve been looking at the Brieftons NextGen Spiralizer or something a little bigger and more sturdy so I could use for more than just zucchini. I seriously need to get myself a spiraliser, this looks so so good!! This looks quite tasty! Thanks for sharing at the #HomeMattersParty. We hope to see you again Friday!